The USB Headset Adapter improves computer audio. 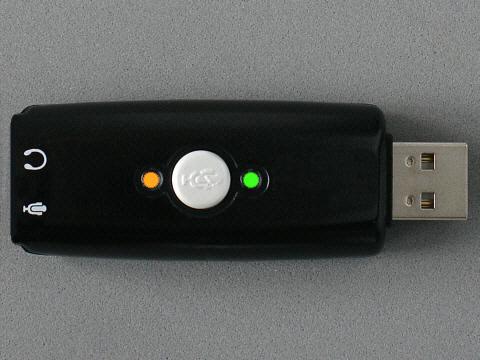 It connects any standard microphone headset to a USB-A socket, by-passing the computer's sound card. It measures 70mm x 25mm x 13mm, and has a USB plug, two mini-jack sockets, two LED lights, and a mute button. It comes with a one metre optional USB extension cable, and an installation CD. Headsets come with speech recognition software, such as Dragon NaturallySpeaking, and are often used for demonstrations, presentations, recording, broadcasting, performance, games, voice-overs, language learning, video cameras, internet chat, and computer telephony applications such as Skype. Unfortunately, some sound systems suffer from electronic noise generated by screens, magnets, coils, starters, motors, power supplies, disk drives, and circuit boards. And some notebook computers have built-in budget audio devices with poor noise suppression. Microphones can't reduce, cancel, or reject, electronic noise inside the computer. The USB Headset Adapter by-passes the sound system, and routes audio directly, via the USB interface, to and from the processor. So, if working with a clean signal is important, a USB adapter is the best option. To use it, just plug it in: the computer recognises it, and adds it to its list of devices. Connect your earphone and microphpone to the adapter. The installation CD provides advanced software features for multi-channel 5.1 surround sound. For speech recognition software, don't install it: remember this, as it's not in the instructions. The device has a black plastic body, a USB-A plug, microphone and earphone sockets for international-standard 3.5mm mini-jacks, two LED lights, and a mute button. The green LED flashes during audio activity, and the orange LED reminds you that the mute button has been pressed. It can be used with a longer extension cable or a multi-port USB hub, although the shorter the cable the less chance of any electrical interference. It takes power from the computer's USB socket, so doesn't need a battery or a mains adapter. It uses so little power that it doesn't even get warm when it's connected permanently. The adapter is full duplex audio, for mono recording and stereo playback. It uses a 20 bit A/D convertor, sampling at rates of 8kHz to 48kHz, and an adaptive D/A convertor, sampling at rates of 5kHz to 55kHz with integral filtering. The sampling rate is controlled by the host at 8kHz, 11kHz, 22kHz, or 44kHz, either as an 8 bit or 16 bit stream. It supports a maximum serial data rate of 12Mb/s, a microphone gain range of 22dBm, and an earphone gain range of 46dBm. It's CE marked, confirming that its electromagnetic radiation will not adversely effect wireless communication, and normal external electromagnetic radiation will not adversely affect its performance.